Used Cogeneration Units / CHP Units or used combined heat and power (CHP) generators produce both electrical energy (electricity) and thermal energy (heat). Combined heat and power plants are available in many different variations, with CHPs differing both in terms of power, fuel consumption and the energy conversion technique. The used CHP units or combined heat and power units are mainly used for communal wastewater treatment or municipal communal facilities, as well as for industrial installations. The combined heat and power plants are in good working order. Partially, they are already dismantled and stored but sometimes still in operation and can be inspected at the customer site. Small CHP units or Nano-CHP modules start at approx. 1 kW to about 2.5 kW electrical power, are suitable for the heating of single and multi-family houses as well as in low-energy homes. The next size is Micro CHP in the range of power of about 2.5 to 20 kW electrical power and is suitable for multi-family houses and small companies. In addition, the class of Mini-CHP of more than 20 to 50 kW of electrical power is used in larger properties, residential blocks and small local heating systems. Medium-sized CHP with an electrical output of several hundred kW to 5 MW are often used by municipalities to heat housing complexes, indoor swimming pools or larger commercial enterprises. Large CHPs on the other hand, have more than 5 MW and supply heat to entire neighborhoods, municipalities and industrial areas as well as factories via district heating networks. As a rule, combustion engines (vegetable oil engines, diesel engines or gas engines) are used for the operation of Cogeneration Units combined heat and power plants, but gas turbines or Stirling engines can also be used. 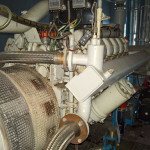 Please do not hesitate to contact us if you can not find the right cogeneration plant CHP.